I don’t know how some of you are going to feel about this makeover. 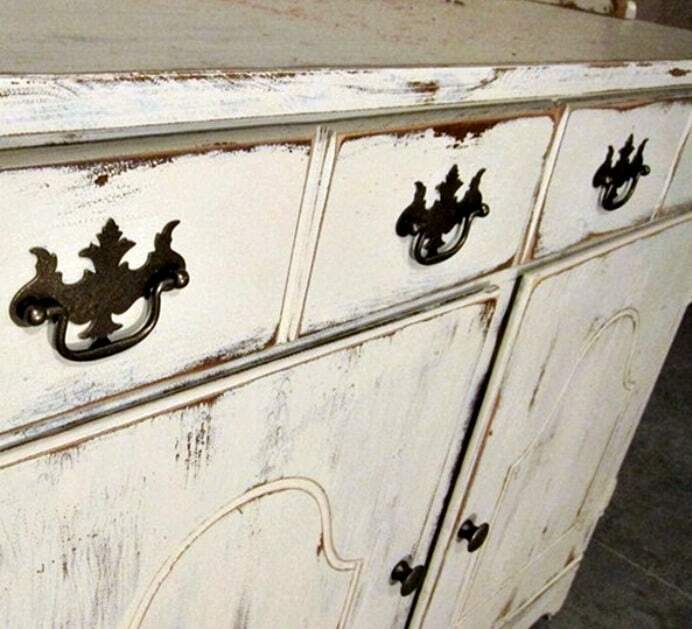 The distressed shabby white dresser is a bit over the top. I finally have a furniture makeover to share. It’s been a little crazy around here with the Haven Conference, sick grandchildren, and visiting relatives all happening the past 10 days. But……I’m back! You know, I guess I say this too much but……I really love this piece of furniture. Seriously, I’m not patting myself on the back….I’m just surprised. I’ll start working on a piece and before it’s finished I’m having second and third thoughts….not sure of the color, not sure of the technique, not sure of the hardware, etc. And when the piece is finished it might look ok, or it might look good, or it might look like crap, or it might look great (to me). I purchased this vintage dresser at the July Nashville Flea Market. I loved all the curves and the door and the legs and everything. I had to fill holes on the drawers. There were 4 holes on each drawer for pulls! Why in the world. I decided on a single knob for each drawer and I picked up these cuties from Hobby Lobby. I had to make two trips. I selected the large knobs and two smaller knobs for the top drawer. I put them on and the small ones just blended in. I was in a hurry to take photos and get this post out so I made another flying trip to Hobby Lobby (good thing it’s only 10 minutes away) for 2 more of the large knobs. I think the two trips were definitely worth it. I asked the JTS what he thought of the knobs and he said, and I quote “They make a statement”. He’s learning (insert smiley face)! I painted the dresser an off-white and distressed it very heavily with an electric sander. The painting, drying time, and distressing took all of 3 hours. Really! So what do you think of my distressed shabby white dresser? Too much distressing for you? Be honest, but be kind. And what about those “statement knobs”? 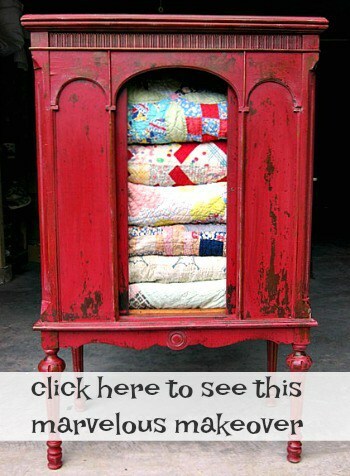 If you like distressed furniture you will love this post….. I am planning to do something quite similar to this. I was thinking I would use white. However, I noticed you used an off-white. It looked white. Do you remember the name? I do not want a color that is too creamy or yellow or too grey. You know? But the more I think about it I’m afraid a straight white may be too stark. I love this piece by the way. The piece I am going to do is a dresser I’ve had for almost thirty years, and I got it at an antique mall when I was 16. I think it’s a great way to keep a piece I love and have a connection with that no longer fits into my style. It has been in the guest room, but I want it in my room now. We are downsizing, and I can’t imagine getting rid of it. What I love so much about this piece is that it reminds me to let go of my inhibitions and create from the soul. That is hard for me to do, at times, because I am too controlled by “What would other people think?”. But you nailed it! And it doesn’t really matter if it appeals to me-though it does. Thanks for reminding me to create more freely. Love this little piece of furniture. Great job and its never enough distressing. The knobs are lovely. Hobby Lobby is the go to place for us distressed lovers. AMAZING! LOVE IT!! is that for sale??? 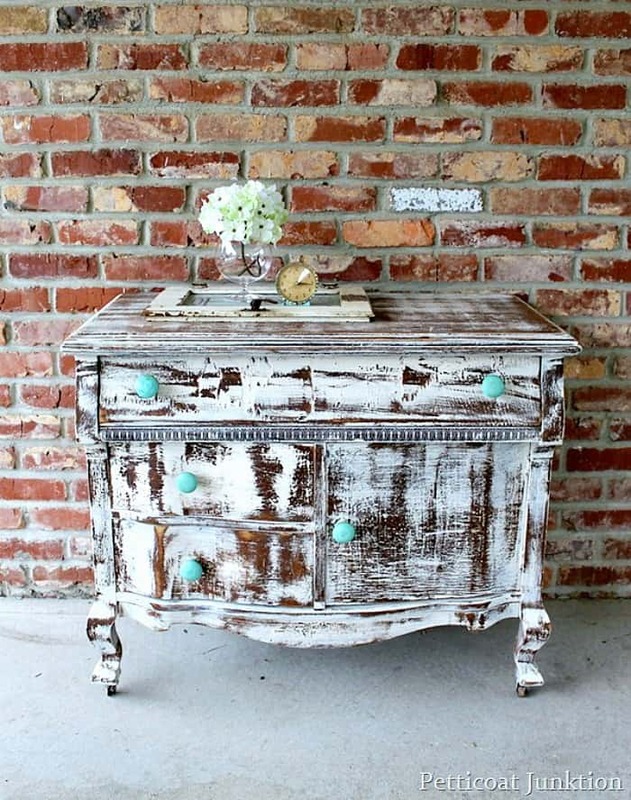 I like this, especially the turquoise knobs. I would be scared to distress that much, especially on my first time. I came to this sight because I am looking for ideas to refinish an odd chest to use as a coffee table. It already has similar knobs and we were looking for a way to incorporate our blue accents into the refinish. This may be what we do! I love your work. This one, well too much distressing for me. This is a great find. The knobs are great they do make a statement. Thank you for sharing. Beautiful!! You did a great job on the dresser. Thanks for sharing at Throwback Thursday. I am absolutely in love with all of your furniture! I started a small business of my own redoing furniture as well. Still learning and wanting to learn more. You have given me soooo many more ideas on what I want to do with all the furniture I have. That milk paint sounds AMAZING!I can’t wait to give it a try! 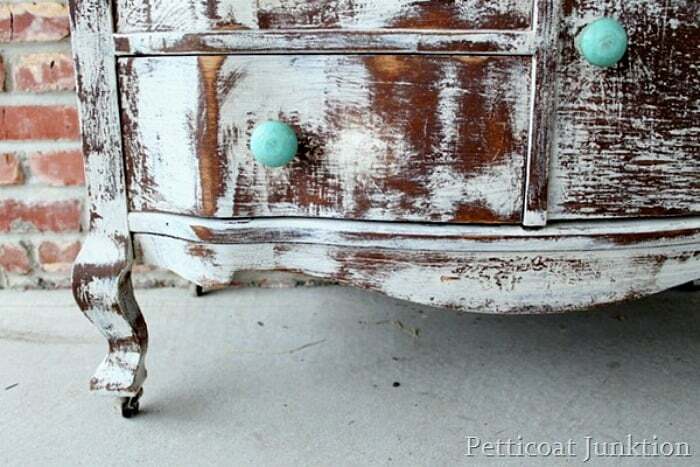 I love the distressing, Im working on a white night stand at this very moment, and thinking of distressing the same way. Look amazing, thank you for the inspiration. I absolutely love it….I’m doing a mantel and I think after seeing this I’m going to heavily distress it as well.it is just awesome. And this piece (and those knobs) make a statement – the good kind! That is so ME! I go thru that on every project I do –granted I don’t do all that many but it helps to know that one that does do a lot feels those feelings too. Connie, glad to know I’m not the only one that gets crazy before a project is finished. I love this look. 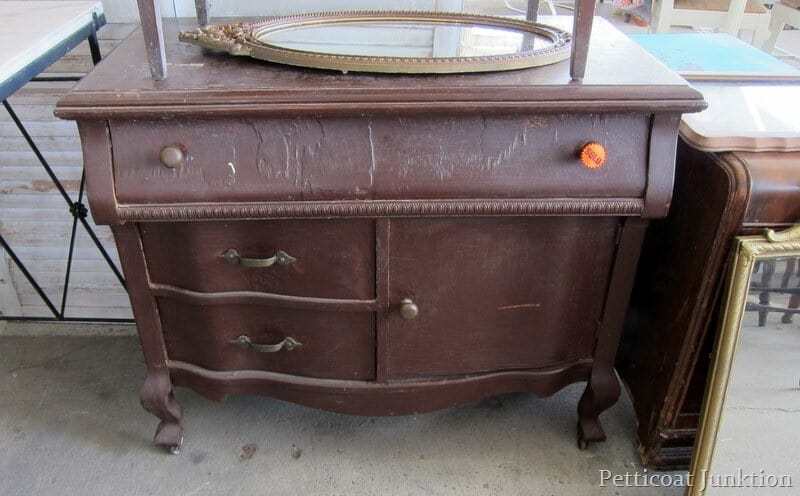 I think I will try this same look on a similar bureau I picked up at a church rummage sale! Beautiful! Has so much character!! woow… that´s a great job 🙂 really nice…. Oh my word this finish is gorgeous!!! ADORE! Love it! It is over the top distressed, but I think that (and of course the knobs!!) are what make it so totally unique and awesome! I love that you do so many different techniques! The best part about paint is, if its not what you wanted, you can fix it! This is perfect though! Love it! Why? Because it’s unique. I’ll be honest, I am tiring of seeing the same paint techniques on furniture lately. My home is small, so when I choose a piece, I want it to be special. Thank you for inspiring me! Very nice! 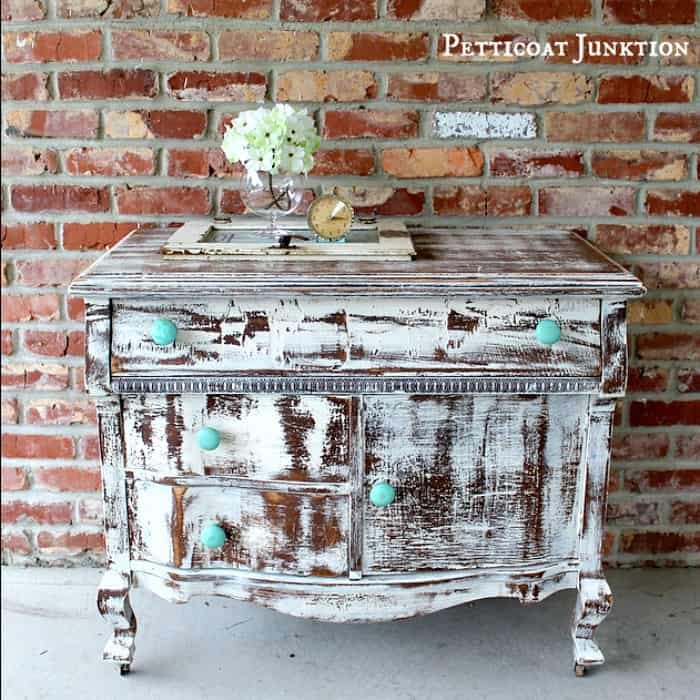 It is very heavily distressed, but I like it, and the knobs I love the turquoise. Beautifully done! Yes, the knobs make a statement,what a great color. I love the way you heavily distressed it as well. I love love love this dresser! The turquoise knobs really add and extra dimension. Looking at the thumbnail on MMS it looked like it had more layers of paint (and would have taken more time) just thanks to the colored knobs. I am definitely going to try something like this soon! I love the distressing on this piece!! Very cool effect. And the turqouise knobs are great! I absolutely LOVE it-yes it makes a statement and that is one of it many great features! I would love this gorgeous piece in my home! I love it!! And the knobs are perfect – icing on the cake! Great job! Wish I had it for my house! P.S. I have an old beat-up dry sink that needs help. 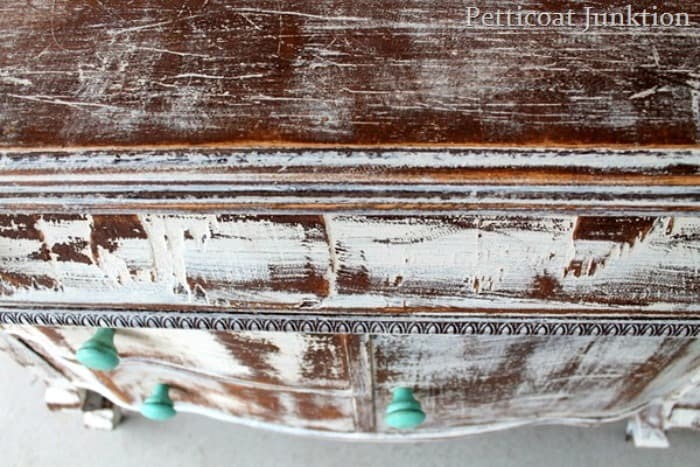 I think I’ll try this white paint/excessive distressing on it–when I get around to it–LOL. In the meantime, I’m going to print this and put it in the top drawer. Regina, please share a picture when you paint your dry sink. I like the excessive distressing on this one and appears to be a good size for such a treatment. The distressing makes the damaged wood on the top drawer hardly noticeable. However, I would have left the top unpainted and would have centered the knobs on the two small drawers. Good job overall, though. I LOVE your dresser. I think it almost looks white-washed. This piece is one of my fav’s!!! Normally that much distressing would have me in distress! Here though I have to say I like it. Maybe it’s because you added a fun bright colour for the knobs! Keep the projects coming! I also love this piece, but the heavy sanding kinda’ leaves the marks…and the beautiful knobs get lost. Just my thoughts…however I have truly loved all the pieces you have done, but a couple I am in love with – the red cabinet and yellow piece with the funky hardware. Keep on going – wish I was that fast, takes me hours to get one thing done! So absolutely gorgeous. I love the chippy look – you did a beautiful job! Oh, I love it! I would love to have it! You did a wonderful job!!! I enjoy your blog, keep up the good work! Please keep up the good work, I am learning too and you’re a great teacher! Thanks for the comment Andrea and I appreciate your opinion. It is over-the-top distressed! I too love it. The distressing is awesome and just what it needed as you can see the veneer was not in perfect condition. But i can see how for some it’s too much. The pop of color, just right. I’m glad you mentioned the process of emotion because I too go through that Oh no I don’t know if its right, do I like it, is this a mistake. Great job. Keep them coming. yep, the emotion is definitely there when we work on our projects. Kathy, I love this dresser! Oh I love it Kathy!!! It’s so fun!! I love this little dresser too!!! It has such a personality, don’t ya think. The knobs are fabulous. good choice. The distressing is a bit too heavy for me. Just a little too rustic for my taste. And about filling holes, I am working on my bedroom set and having the darndest time finding hardware. 4in center hole pulls are not easy to find!!!! Guess I will have to fill the the many, many holes! 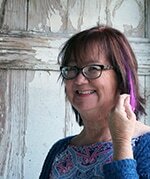 Thanks for your inspiration Kathy!